exclusively for UAD-2 hardware and Apollo interfaces. A thorough emulation of Manley’s flagship boutique tube EQ, the Manley Massive Passive EQ plug-in excels at radical tonal shaping, delicate shading, or mastering enhancement. The Manley Massive Passive EQ plug-in expertly captures the hardware’s unique filter curves and musical distortion as well as its unparalleled clarity. Officially licensed and endorsed by Manley Labs, the Manley Massive Passive EQ plug-in expertly captures the behavior of the hardware, from the signature filter curves, to the multiple band interdependencies, down to the tube amplifier distortion, and all-important transformer/inductor hysteresis. 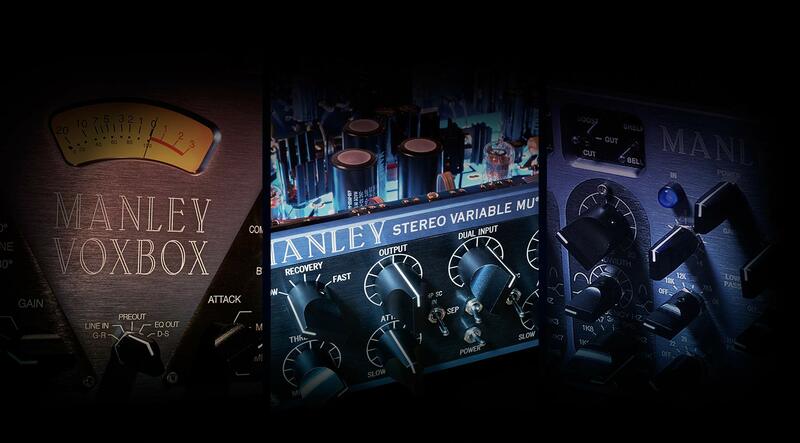 Manley’s VOXBOX channel strip is a blend of tube circuits, designed specifically for vocal sources. Featuring UA’s Unison™ technology, the Manley VOXBOX Channel Strip plug-in is a stunning emulation of the hardware, capturing the its tube preamp, optical compressor, passive EQ, and de-esser/limiter sections. For years, the Manley VOXBOX has served as a secret weapon for bassists looking to harness its tube signal path and slick EQ and compression appointments. Engineers have also called on the Manley VOXBOX for guitars, strings, and drums as it elevates any source way beyond the ordinary. Manley Labs' Variable Mu tube compressor exudes hand-made craftsmanship. A gold standard among mixing and mastering engineers, the Variable Mu adds clarity and cohesion to buses or your entire mix. 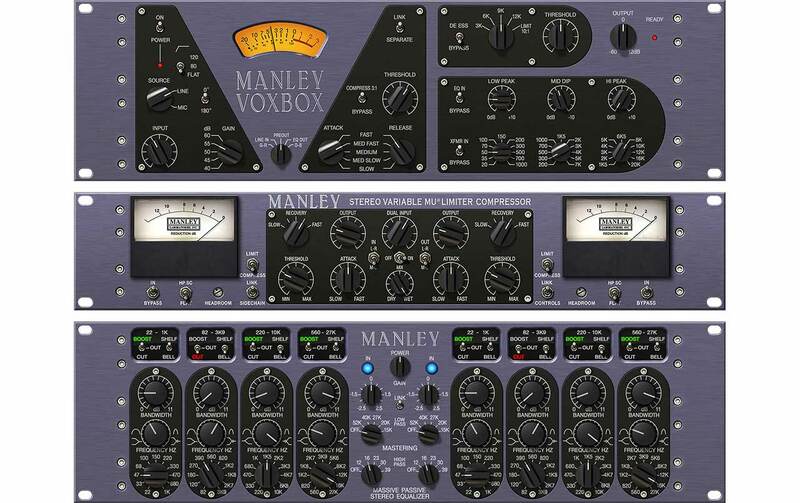 The Manley Variable Mu Limiter Compressor plug-in is a thorough emulation of this legendary limiter, and is based on the “6BA6 T-BAR Tube Mod” unit. The Manley Variable Mu Limiter Compressor plug-in can be used on single instruments, or on subgroups like strings or horns. But its raison d'être is on the mix bus, where its expert features can unify your mixes with a hi-fi fit and finish. Believe the Hype - magnificent! I think this is a decent plugin but needs to be used carefully. I think the "analog" sound is just the smearing this plugin does to your audio. It may be useful on soft synths or certain instruments but on vocals (ironically) I think once you get past the initial "wow, it sounds really warm" factor, you begin to realise it's just smearing the sound a bit. The punchiness and clarity goes and you're left with a recording that's awkward to fit into the mix. Might be good for harsh vocalists/mics but do be a bit careful that the 'warmth' isn't just a loss in tone and clarity. Probably useful on a good few things but for, I'm slightly underwhelmed. I've been using the real VoxBox everyday for 20 years. I've been asking UA for this for at least 10, and it finally came, yes!!! I just had the opportunity to test it on my laptop in a Paris session, and I was completely blown away. It sounds THE SAME!!! Now my studio and travel setup match perfectly. Now if my original Voxbox dies, I'll have a backup, and now it's in my travel template. I never bought the hardware unit over the years and only briefly used one on a session one time, but i tried this again and am hooked on its very unique ability to make a vocal sound like a million bucks! Thanks so much for bringing this one to the stable.....Incredible. The Vari-Mu and Massive Passive plugins are my favorite plugins during mastering, the new VOXBOX plugin, after testing it extensively, has become my favorite plugin on lead vocals. It's basically all you need to make a vocal sit perfectly in the mix. The compressor is smooth and versatile, as it has a lot of attack/release options. The gain, when pushed, adds some extra character, just perfect! The de-esser is smooth and very effective in my experience, I have not found a de-esser plugin that sounds as natural as this one. The EQ section is smooth and can shape a vocal to taste. UA and Manley did it again, what an amazing plugin! Until now i used the API Channelstrip for my voiceover jobs. But i have to say the Manley Voxbox ist now my everyday-Strip. I like the colour that it adds and i like the eq very much. Especially the middle-section to cut out - very subtile - the mud. All in all it sounds very warm and brings my voice to another level - great job UA!!! This has it all; tone, character, and ease of use. Oh Yeah, did I mention it sounds stunning. 14 day trial is simply not long enough, so how would you like my money...Cash, Credit, or Debit? Either way you're gonna take this money, cause I can't go on living without my Manley Voxbox. Manley is Great, but Universal Audio is Awesome! I'm serious...Take my money!!!! OMG Best describes demoing this incredible piece of gear (Plugin)! Why do I Demo these plugins? Oh well here I go again on another UA Crack Bender. The De Esser is crazy good. The Unison Pre, The Opto Comp, The EQ, The filters.... This thing is just Wonderful. Well back to rehab after the VoxBox and Ampeg purchase! WARNING IF YOU DON'T WANT TO SPEND MONEY DO NOT DEMO THIS MANLEY VOXBOX! YOU HAVE BEEN WARNED! The Manley VOXBOX PLUGIN...I never heard the physical piece, but one word for the plugin, Dammmmmm. I mean this has to be one of the best if not the best plugin ever made. Vocals,bass,keyboards all had overly excellent results. I even tried it on my mix bus, It knocks it out the park. I've been mixing for 2 years,so I'm still amateur. But I swear to you this plugin has finally graduated my music to a professional sound that I longed to accomplish. I just sat here smiling to myself from the results I was getting. And I don't work for universal audio..They just got it goin on. Thank you tho universal audio. And thanks for the 50 dollar voucher. Keep em coming, I still need the Chandler Curve Bender. The preamp section of this thing is insane. Instant tone. I kid you not, It feels and sounds like a real tube pre!!! This makes me so excited to see UAD's new releases coming up!!! Haven't used the hardware, so this is a virgin opinion. In short, the unit sounds nice. You get a definite sense of audio quality when it is flipped on. I hear a definite emphasis on the upper bands in the compressor. Pushed hard, the effect can be fatiguing and becomes an issue that I'd usually be compelled to compensate for. The emphasis can be cool if that's what you're after for a particular application, but if you are looking for something more even in its dynamic response, this isn't would I'd personally go for. In a shootout with bx_console (far and away my preferred channel strip presently), VoxBox could not keep up. But I imagine this makes a hell of a Unison-mode mic pre that cuts through, which is what it was designed for. i love the manley massive passive. amazing clarity and head room. i use it pretty much exclusively on the master fader, and it subtlety livens up the mix. i'm still new to it, as well as mixing, but i'm in love with this plug. now if i could only get 5k together to A and B it with the hardware, then i could comment on its big brother. Fairly useless on most individual tracks, except for a last finish of some very critical / outstanding ones, but a must on master. As Bob Katz said about this plug (Beat/DE), the manley eq is one of the not substitutable tools if you have to master / fit recordings which sound as they come from the garage - but this plugin is one of the first analog emulations which does it on a similar level too.